Many majors meet qualifications for advancement into medical, dental, pharmacy, graduate and law school. We award more than $760,000 in scholarship money to our students every year. What can you do with a Bumpers degree? If you're interested in a meaningful career working toward advancements in food, family, and the environment, then Bumpers College is the place for you. We offer 14 majors and 24 minors to customize a degree path that leads to an innovative career in science, business, agriculture, community development and more. 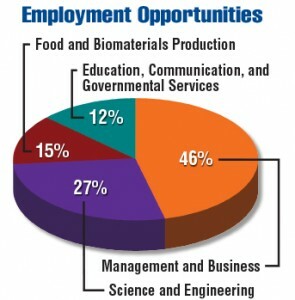 A recent USDA study reports by 2020 the number of positions in agriculture and life sciences will vastly outnumber graduates in these fields, and these career opportunities are largely STEM-based (see graph). See our list of majors or contact us to determine where you can go with a degree from Bumpers College. Make sure you've got the important dates for the spring semester on your calendars! Follow the Ag Food Life Blog!